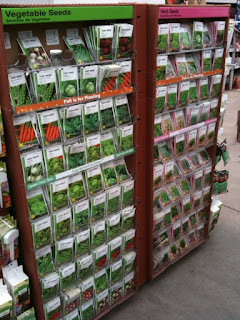 I saw the first seed display of the season a week and a half ago at a big hardware store, the one that starts with "L". It was sandwiched in between some sorry looking poinsettias and those cardboard boxes full of Christmas wrapping paper. My first instinct was to buy some seeds, of course, but then I remembered that we hadn't even celebrated Christmas yet. So I started a little chant in my head. "There will still be time to buy seeds after all the holiday festivities." Three more seed catalogs showed up in the mail yesterday. My first instinct was to skip the holidays and begin reading those seed catalogs. Then I remembered that I have Christmas gifts to wrap and I repeated my little chant. In fact, there will be plenty of time after the holiday festivities to buy seeds, to read through the catalogs, to dream about the garden. After all, today is just now the first full day of winter. I won't be planting peas until March 17th. And I haven't made my big seed catalog announcement yet! I am also chanting with you. Even though I suggested in my newspaper column for The Recorder, that Botanical Interests seeds, already available locally would make a good present. And I posted about Heirloom seed catalogs today. I can't get seeds out of my mind. But I haven't begun buying. There is plenty of time for that. I just received the new Burpee catalog yesterday, so exciting! I have a huge box of seeds next to my chair, ready to go! I was so tempted to start sorting them out a couple of weeks ago, your post really made me laugh. When does gardening season start for you guys? I don't even start thinking about seeds until January or February, planting doesn't start inside until April and outside until May. I'm chanting. And, I'm planning to go hog wild on seeds this year! Oh so true. Unfortunately your post is a month too late for me - I've already bought mine! I admit, coming home to a stack of garden catalogs is very tempting!!! And as soon as my house recovers from Christmas, I'll be shopping too.